It remains axiomatic that the supply of tradable real estate is fixed, and it has key traits that attract alternative investment managers. I wish Elon Musk the best of luck in colonizing Mars, but until he succeeds, it’s axiomatic that the supply of tradable real estate is fixed. In fact, in posh parts of Planet Earth—the Champs-Élysées in Paris, Manhattan’s Fifth Avenue or the Peak in Hong Kong, for example—real estate is almost inelastic, meaning that no matter how red hot the demand, increasing supply is not an option. It’s a simplistic observation, but the supply and demand equation explains the basic appeal of real estate investing. Plus, real estate has key traits that attract alternative investment managers—inefficient pricing that can be exploited by active management, with the potential for delivering higher returns and diversifying the portfolio. Sophisticated investors have been investing in real estate for a long time. By 2014, they were targeting an average allocation of just over 9% to various strategies like direct investments, private funds, real estate securities, real estate debt and real assets, according to a report from Cornell University’s Baker Program in Real Estate. Some allocate much more. 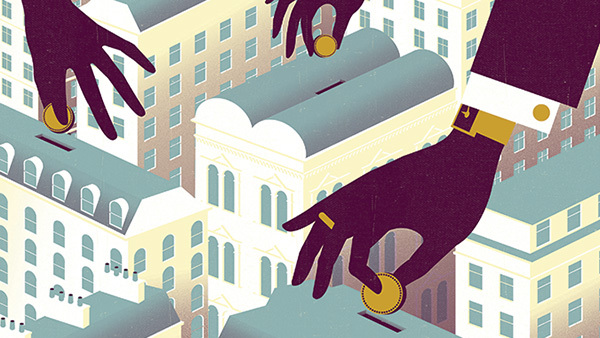 Yale University’s endowment, led by David Swensen, who has done more to spread the gospel of alternatives than anyone, allocated 17% of its $24 billion portfolio to real estate this year. Individuals have been slower to invest in real estate and that’s understandable. It wasn’t until the introduction of real estate investment trusts (REITs) in the 1960s and favorable tax considerations in the 1990s that made this investment class easier for individuals to access. But institutions still have advantages over individuals. Unlike you and me, Yale can absorb the ups and downs of markets better because its investment horizon is arguably infinite. Individual investors, by contrast, have two immediate concerns: What if there’s a repeat of 2008, when real estate values swooned along with just about every other asset class except cash? Second, what happens when—not if—interest rates rise? In today’s risk-conscious environment, investors want to hedge their bets on every asset class. Fortunately, unlike 2007, it is easier and cheaper for individuals to potentially mitigate downside risks in real estate by investing in real estate mutual funds that can go both long and short. So far, there are only a handful of these funds and—full disclosure—Altegris, my firm, offers one of them. Typically, these long-short real estate funds buy securities such as REITs and real estate operating companies, and hedge their positions with ETFs and derivatives, or by purchasing put options, writing covered call options or selling securities short. It is important to note that short selling is considered speculative and involves financial risk. The second concern, rising interest rates, is clearly on investors’ minds after years of historic low rates. Conventional wisdom holds that when interest rates go up, the value of real estate goes down, but that assumption does not always ring true for the entire real estate sector, according to an analysis of REIT values we published in 2014. After examining seven periods of rising federal funds rates going back to 1972, the white paper concluded that during those seven periods of higher rates, REIT values (including dividends) increased in five. That’s not so mysterious. Higher rates can also reflect a more robust economy. As economic activity increases, vacancies can fall, rents can increase and real estate prices can climb. If rates keep rising, of course, economic activity can stall and demand for real estate can wilt. But at that point, rates could likely fall once again to spur economic activity and real estate values would likely change again. The cycle repeats. Another white paper we published adds weight to this finding. Taking data from January 1976 through December 2014, it found that adding publicly traded real estate to a stock and bond portfolio has historically improved a portfolio’s risk-return profile versus one comprising solely stocks and bonds. As with all alternative investments, real estate may not be suitable for everyone. What I’m suggesting is a new way to look at real estate investing—that the specter of rising interest rates should not be a deal-breaker, and that with hedges in place, there’s potential to mitigate risks or even profit during a market downturn.